It's been a while since my Mature-Girl Cheese post that everyone loved, so I decided to share another decadently nutritious gluten-free vegan grilled cheese recipe with ya'll. I was really excited to try out the new Daiya slices, and as you can see in the photo below, they did not dissapoint! Turn on a panini maker up to high. If you are using the truffle oil, place in a small bowl with the kale and toss it up so the kale is lightly coated. 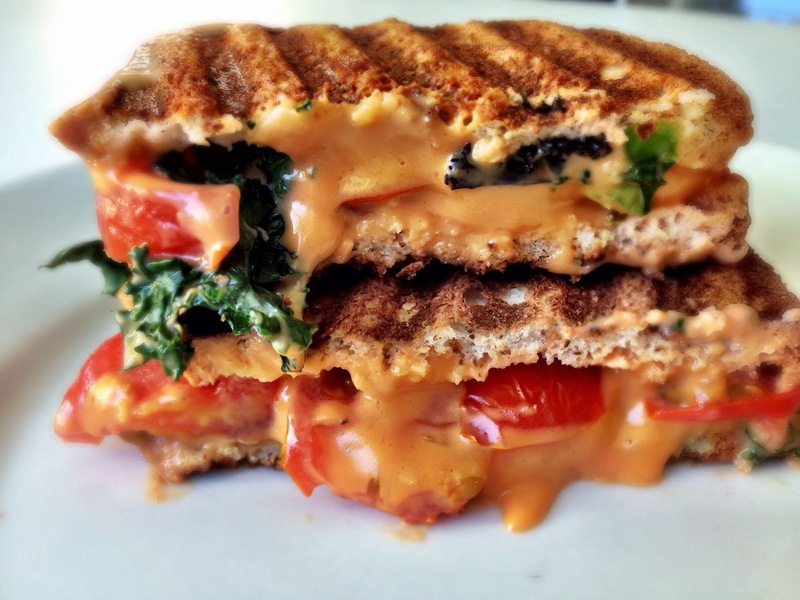 On 1 slice of bread, place kale, and top with cheese, then sliced tomatoes. Finish with the 2nd piece of bread. Put the sandwich in panini maker for 7-10 minutes, and remove right before the cheese starts to melt over the sides of your bread. Allow to cool for 2 minutes before slicing in half. Wow! This looks totally amazing! I'm on a detox right now, and I can't have vegan cheese. But it's over next Monday, and this will be one of the first things I make! This is looks delicious! Mouth watering. I am obsessed with truffle olive oil. You're so creative. Made this with the Ezekiel sprouted tortillas, and used sliced large Roma tomatoes, and olive oil w/ white truffle oil - YUMMM. Quite addicting!